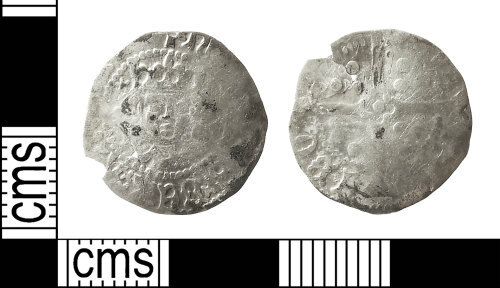 An incomplete and worn Medieval silver penny of Henry V (1413-1422), minted at York. Class C, 1413-1422 (North 1991: 71, ref: 1400). Obverse: hE[ ]REX A[ ] (saltire and double saltire stops); Crowned bust facing (hollow neck and armpits), mullet to left of crown, broken annulet to right of crown. Reverse: CIVI/TAS/EBO/R[ACI]; Long cross dividing the inscription with three pellets in each quadrant, quatrefoil at centre of cross. Diameter: 16.7mm. Weight: 0.78g. DA=12:6. North, J.J. 1991. English Hammered Coinage, Volume II, Edward I to Charles II, 1272-1662. Spink & Son, London.